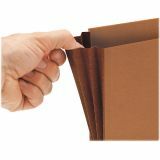 Smead Extra-Wide 5 1/4" Expansion Wallets w/Elastic Cord, Legal, Redrope - Extra-wide wallet allows letter-size or legal-size top-tab file folders to fit neatly inside without bulging. Perfect as a complete client file. 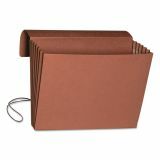 Protective flap with elastic cord closure secure documents for travel. Wallets feature RedRope stock with contrasting gusset, double thick front and back panels. 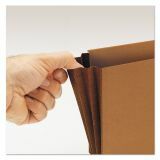 Full height Tyvek lined gussets have rollover Tyvek reinforcement at top. 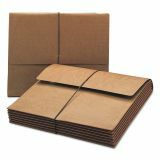 Contains 30 percent recycled material and 30 percent post-consumer material. Expands up to 5-1/4". 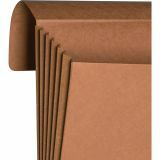 Extra-Wide Legal Size 15 3/8" x 10"